Tom's Blog: Where on a site are the oldest bur oaks? 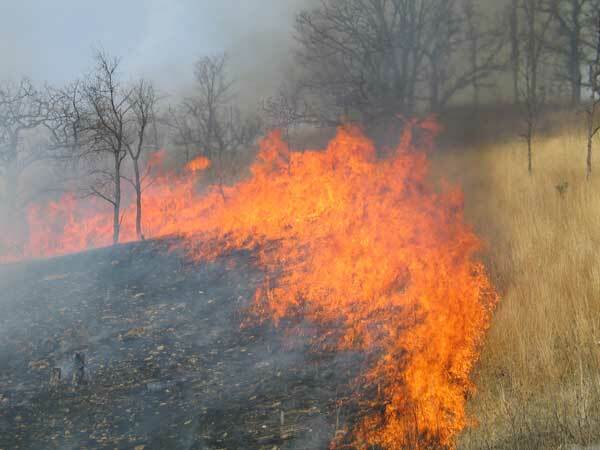 Prairie burns in the fall? Where on a site are the oldest bur oaks? In those days, the bluff prairie almost certainly burned frequently, probably annually. The only trees visible are a few right at the top of the bluff. Barzen told us that these trees are still present and that they are bur oaks. Interestingly, they are not situated at the "top" of the bluff, but some distance farther along the level. Why? Probably because the steep topography causes the up-slope burn as a headfire, but once the fire reaches the level, the headfire turns into a gentle fire before it goes out completely. I discussed the relationship between bur oaks and fire in a blog post in 2014. See this link for details, photos, and a map. At Pleasant Valley Conservancy we know that all of our really ancient bur oaks are just a bit down hill on the north side from the ridge top, where (as noted above) the fire goes out. Headfire roaring up the south slope. Although the trunks of bur oaks are fire resistant, their upper branches are less so and can be seriously damaged. This photo was taken in 2005. This large headfire was a surprise to us. We had been burning the south slope since 1998, right after restoration was completed. Initially, the prairie grasses were only in scattered patches and did not carry a fire well. But by 2005 everything changed. Now to protect the venerable bur oaks we only burn this slope as a backing fire.